The most effective solution for night time teeth grinding and biting. It's one of those habits that we all tend to do it without even realizing it. If you're waking up every morning with headaches or your jaw feels sore overnight then you're most likely grinding your teeth at night. BioGrind is the #1 rated Anti-Grinding Mouthpiece on the market for obvious reasons. We've been in the market for years so we know all about the different problems that you might occur with the other mouthpieces. We've addressed those issues and made adjustments accordingly. What are the benefit to using BioGrindTM? 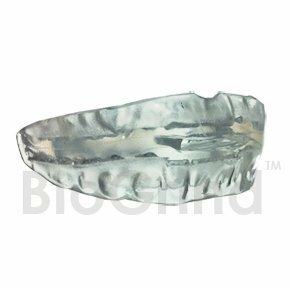 BioGrindTM prevents your teeth from grinding by forming a soft gel cushion between your upper and lower jaw. BioGrindTM also features an opening for you to breathe naturally and more relaxed. Dentists offer similar mouthpieces at $600+ that does the same thing. BioGrindTM is a great alternative solution that won't cost you a fortune. Some use BioGrindTM to see if they're comfortable with the idea of sleeping with a mouthpiece before committing to the more expensive one. But throughout the years, about 4/5 customers end up preferring BioGrind over the $600+ mouthpiece due to its level of comfort and the huge price difference!! BioGrind mouthpiece is custom made at home to ensure a comfortable and lasting fit. A travel case and simple step-by-step instructions are included. If theres any questions about the product, feel free to ask on this product page or contact the seller. We're open to all ideas and will try to address every concerns you may have. If you have any questions about this product by BioGrind, contact us by completing and submitting the form below. If you are looking for a specif part number, please include it with your message.